A thick, dark smoke pours out of old Number 40. The engineer taps a gauge and pulls on the steam whistle cord. The conductor ushers the last stray into a passenger car and waves. The Nevada Northern Railway is ready to roll. Each summer, hundreds of visitors travel to Ely (located about 300 miles east of Carson City via U.S. 50) to see an operational railroad that some consider one of the best preserved shortlines in the country. But unlike most tourist railroads, the Nevada Northern Railway is also a museum. And because the railroad operated as a commercial business until the early 1980s, everything appears much as it did during the Nevada Northern’s heyday. The Nevada Northern was constructed in 1905-06 by the Nevada Consolidated Copper Company. Its main job was to haul copper ore from mines at Copper Flat, located west of Ely, to a smelter in McGill, 9 miles north of Ely. After processing, the copper was then transported on the railroad from McGill to the Southern Pacific Railroad lines at Cobre, a station located 130 miles north. By 1908, the railroad was offering passenger service. During 80 years of commercial operation, more than four million passengers traveled on the Nevada Northern Railway. A special daily school train carried McGill youngsters to Ely until 1941. In 1915, Kennecott Copper Company began acquiring the stock of the Nevada Consolidated Copper Company, completing its purchase in 1932. The railroad continued operations until 1983, when Kennecott decided to shut down the copper mines, the smelter and the railroad, which were no longer financial practical. By 1985, Kennecott donated to the city of Ely the East Ely Depot, the adjacent buildings, several miles of track and the railroad rolling stock. In 1992, the depot building was restored. Wandering through the Nevada Northern Railway Museum, you feel as if you’re in a time-warp. Nearly everything, from oak roll-top desks to the dirt floor blacksmith shop, is the way it was during the 80 years that the Nevada Northern was operating. There’s a sense that the railroad is still run by the copper company—that everyone just went home for the weekend and is coming back on Monday. The oak desks, filing cabinets and even the black ceramic telephones in the depot building are original equipment installed when the railroad was built in 1906. The railroad never replaced or removed anything. The guided tour usually begins with a walk through the two-story East Ely Depot building, the centerpiece of the museum. Inside, visitors will find elegant antique wood and brass ticket windows, benches and light fixtures. At the Transportation Building, several Nevada Northern locomotives are on display, including a rare 1907 steam-powered rotary snow plow, a massive steam-powered crane, also built in 1907, and the handsome steam ten-wheel Baldwin locomotive, Number 40—called the “Ghost Train of Old Ely”—which was built in 1910. Other buildings house many of the 50 or so pieces of rolling stock owned by the museum, including early 20th century ore cars, flat cars, cabooses and a 1917 coach car that was converted into a rolling bunk house for mine workers. Between Memorial Day and Labor Day, guided tours are offered four times daily. The rest of the year, someone is usually working in the shops, so you can usually get an informal tour of the facility. Of course, the other treat is a ride on the old rolling stock. On summer weekends, you can enjoy an hour and a half trip on the old steam engine Number 40, which travels from the East Ely depot to the nearby copper mines at Ruth (passing through the only curved tunnel in the state). The museum also operates two vintage diesel trains on the "Hiline" route through the beautiful Steptoe Valley. One unique service offered by the Nevada Northern Museum is the opportunity to actually rent the train. For a fee, you can learn to pilot the train around the yard or on one of the excursion routes. While I’ve never done it, I’ve ridden in the engine cab and imagine it would be a blast to actually guide one of these several ton goliaths through a brief workout. A gift shop, the Rail Place, offers an excellent selection of railroad memorabilia, books and other items. For more information contact the Nevada Northern Railway Museum, P.O. Box 40, East Ely, NV 89315, 1-866-407-8326, www.nevadanorthernrailway.net. If bristlecone pines could talk think of the stories they might tell. Perhaps they would recall a time when much of Nevada was still covered with water. Or speak of the prehistoric people who wrote on rocks. As the oldest living things—they can grow for more than 5,000 years—bristlecone pines have outlived most civilizations. Some still growing today were already a few thousand years old before the time of Christ. It’s not surprising that the centuries-old bristlecone pine tree, which is one of Nevada’s two official state trees, has fascinated people since its existence was announced to the world in National Geographic magazine in 1958. There is a quiet majesty and grace to these ancient trees which have seemingly defied the affects of time and the elements. Bristlecones thrive in the most inhospitable of climates and conditions. The trees, which are named after their compact, bristle brush-like needles, grow in rocky soil between 9,000 and 11,500 feet above sea level. Additionally, they seek out unprotected turf, meaning they flourish in areas exposed to the full fury of the winds, rains and snows found on mountain tops. In the best conditions, they can grow to heights of more than sixty feet. and five feet in diameter, although most are about half that size. Despite their desolate surroundings, the trees are beautiful. The older bristlecones become gnarled and twisted, and acquire a special texture and character shared by no other tree. The bristlecone is an unusual tree in that as it ages it allows part of its trunk and roots to die, yet manages to hold on to life. It’s not uncommon to find a bristlecone tenuously hanging on to life by only a thin strip of bark that stretches from a single root to a handful of needle-covered limbs. In his book, “Trees of the Great Basin,” dendrologist Ronald M. Lanner notes that while some writers have wondered why the bristlecone can live so long, the better question is why does it take so long for one to die? He suggests the adverse conditions actually allow the trees to live so long because the environment eliminates competition from other vegetation. Even in death, the trees are remarkable. Because a bristlecone’s wood is so dense and resinous, it takes a long time to decay and is unusually hard. A dead bristlecone can stand for decades. In Nevada, we’re fortunate to have a handful of groves of these unique trees, including stands in the Snake Range, the White Mountains, the Rubies, the Grant Range and a few other sites. The most accessible groves can be found in Great Basin National Park, which incorporates part of the Snake Range, in eastern Nevada. There, on Wheeler Peak, you can find an estimated 8,500 individual Bristlecone plants, although most are seedlings. To reach the Wheeler Peak grove, drive from the visitor center at the park to the Wheeler Peak Campground. The trail, which is at an elevation of 9,960 feet, begins from the parking area near the campground. The walk is about four miles roundtrip with an elevation gain of about 500 feet (dress warmly and carry water). The trail passes picturesque Teresa Lake, then continues uphill via a series of switchbacks to the trees. The stand, which is well described by interpretive signs, is magnificent. As you wander about, you can find trees that are more than 1,500 years old and one said to be more than 3,000 years old. 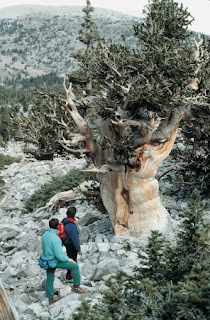 The world’s oldest known living bristlecone pine was discovered on Wheeler Peak in the early 1960s. Sadly, the tree, which was about 5,000 years old, was cut down in August 1964 to, ironically, determine its age. Another good place to see bristlecones is in the Schulman grove (in the White Mountains), located south of Bishop. To reach the stand, head to Big Pine, then travel east on California Route 168 to the Ancient Bristlecone Pine Forest. The Schulman grove is home of Methusaleh, which is now the oldest known living bristlecone pine. It is believed to be more than 4,600 years old. A four-mile interpretive trail winds through the trees. For years, Virginia City billed itself as “the West’s Liveliest Ghost Town.” So, it’s not surprising that the former mining town would be the focus of a great many ghost stories. 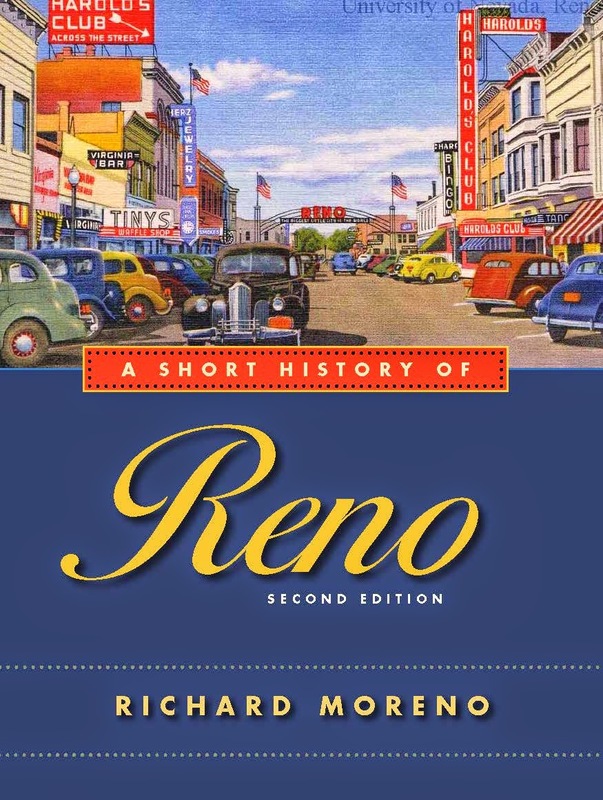 In fact, there are at least two books on the subject, including “Haunted Nevada” by Janice Oberding and “Comstock Phantoms” by Brian David Bruns. 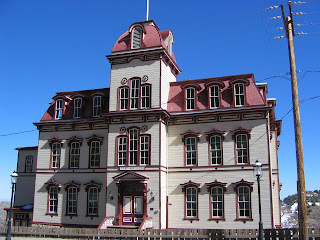 Reportedly, specters have been seen in about a dozen Virginia City places including the St. Mary’s Art Center, which is housed in the former St. Mary-Louise Hospital, built in 1876 and operated for several decades by the Sisters of Charity religious order. Witnesses have reported seeing a woman in long, white robes or a nun dressed in white robes roaming the hallways and looking out the windows of the four-story brick structure. One version of her story is that in 1878, a patient in the psychiatric ward started a fire that killed him and a nun on duty. It is said that she continues to wander the building looking for patients to help and frequently musses the sheets and blankets on the bed in her former room. There have also been reports of the ghost of a blonde-haired woman in the spiral staircase near the back of the Old Washoe Club bar. Opened in the 1870s, the Old Washoe Club was originally known as the Millionaires Club and was a men’s drinking establishment for the Comstock’s most successful business owners. The winding staircase served as the original entrance to the Millionaires Club, which was upstairs. The club offered gambling, prostitutes and liquor to its members. In addition to the female ghost, affectionately called “Lena” by regular bar patrons, there have been sightings of an ethereal old prospector sitting at one of the barstools as well as the ghost of a 13-year-old girl, who some believe was murdered in an upstairs bedroom. People have also reported bar glasses falling from shelves for no reason, doors that lock and unlock and a chandelier that moves by itself. Other ghost sightings have occurred in Virginia City’s Silver Terrace Cemetery, where people claim to have witnessed a strange glowing tombstone at night at the cemetery, and the Fourth Ward School in South Virginia City, allegedly home of "Miss Suzette," a ghost who walks across the schoolyard to the front steps, then disappears. She is believed to be the ghost of a teacher who worked at the school in 1908. There are also accounts of people seeing the ghost of Henry Comstock, one of the founders of Virginia City and namesake for the Comstock Lode. 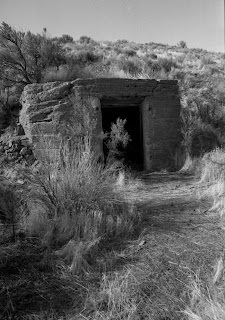 Comstock is said to haunt the old Ophir Mine, located south of the Virginia City cemeteries (near the intersection of Carson Street and Cemetery Road). According to one web site (Haunted Hotspots), in the winter of 1874, an odd and mysterious light suddenly emanated from the mouth of the mine and rose 60-feet in the air. Thinking it was an underground fire, several townspeople investigated but found no flames or smoke. Afterwards, there were unusual occurrences at the mine—elevator cages summoned when no one was there—as well as strange noises. Eventually, the decayed ghost of Comstock appeared, identified himself and said he was reclaiming his mine. Allegedly, he tormented miners by blowing out their candles and howling loudly. The reason for Comstock’s restlessness is that he was an early mine owner of a portion of the fabulous silver vein that bear his name but he sold his holdings for far less than they were worth (supposedly about $11,000). Later, he tried operating several dry goods stores but wasn’t much of a businessman and went broke. In September 1870, while prospecting in Montana, he allegedly committed suicide. Now he is said to haunt his former digs. Both “Haunted Nevada” by Janice Oberding and “Comstock Phantoms” by Brian David Bruns are available from local bookstores or online at www.amazon.com. Long before Las Vegas discovered volcanoes and rollercoasters, the old railroad town of Palisade had discovered the importance of entertainment to help put a place on the map. According to legend, Palisade’s form of entertainment involved a gruesomely realistic shoot-out, held nearly every time a train stopped in town. During the early 1870s, all passing Central Pacific Railroad trains made a brief stop in Palisade for water and wood. When passengers disembarked to stretch their legs, they encountered a crowd of angry, armed thugs. Suddenly, a fight would erupt and the rough-looking gunmen began shooting at each other. As the passengers scampered back onto the train, they looked back to see bodies lying on the street in realistic-looking pools of blood. As the train pulled out, a band of Indians appeared and joined the fracas. Once the train departed, the "dead" miraculously rose from the street and retired to nearby saloons. The attack was all show. The shooters had fired blanks and the blood was from a local slaughterhouse. Today, Palisade is a pretty quiet place. So quiet, in fact, that the entire town site was once sold at auction. In April 2005, a San Francisco-based auction house sold the 160-acre site of the town for $168,750 to an anonymous buyer from the East Coast. The new owner has not announced any plans for the property and remains of the town. Standing in the cemetery that overlooks the former site of the town, you can hear the rushing waters of the Humboldt River, trains passing through a long tunnel, and the wind whistling through the nearby steep canyon walls for which the area was named. In the 1870s and 1880s, Palisade was an important railroad stop, at one time serving three different rail lines, including the Central Pacific, the Eureka and Palisade and the Western Pacific. The town had been established by the Central Pacific Railroad in 1870. Within a few years, it grew to more than 300 residents and competed with Elko and Carlin as a major rail shipping point serving the booming mining camps of Mineral Hill, Eureka and Hamilton. 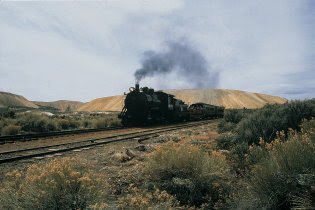 In 1875, the Eureka and Palisade Railroad was completed, which connected the town to the productive mines of Eureka, located about 90 miles to the south. The Eureka and Palisade also located its operating headquarters, a depot (shared with the Central Pacific), repair shops and a large ore transfer dock in the community. For the next 55 years, the narrow gauge rail line transported millions of dollars in ore from the Eureka area, transferring it at Palisade to the Central Pacific (later Southern Pacific) and, after 1910, Western Pacific lines. By the mid-1880s, the community included saloons, a handful of stores and businesses, hotels, a school and several churches. As so often happened to towns dependent on mining, Palisade experienced a slow decline, which started in the late 1880s due to the decreasing productivity of Eureka's mines. In 1910, a major flood swept through the small canyon, destroying a large portion of the town and damaging the train tracks (they were rebuilt). A few years later, fire accelerated the town's demise so that by the time the Eureka and Palisade Railroad ceased operations in 1938, Palisade was already a ghost town. One of the first things you notice when driving over the hill that drops into Palisade Canyon is the incongruous sight of a few mobile homes on the opposite hillside. On closer look, however, you can find the remains of about ten structures in the thick sagebrush and tall grass just above the river’s shore. Most are simply the ruins of crude miner's shacks with concrete and brick walls and, in many cases, collapsed wooden and sod roofs. Wandering through the line-up of partial buildings and foundations, you find other reminders of the town, including the rusted hulk of an old car and other metal scraps. On a hillside above the former main part of the town, you can also spot two tall walls of a more impressive structure. The cemetery tells the most about Palisade. Still in remarkably good condition because it is maintained by descendents of the town's first residents, the burial ground contains both substantial marble monuments as well as some fine examples of wooden markers. Of course, as with any Nevada ghost town, be careful not to touch or disturb anything—most of it is private property. Palisade is located in Northeastern Nevada, about 11 miles south of Carlin. To reach it, travel 9.5 miles south on State Route 278, then 1.5 miles on a marked dirt road.